15 Apr 2019 --- Nestlé and Carrefour have partnered on giving consumers the ability to access information from the first blockchain on a national brand in Europe. This partnership is “based on the shared values of each company to bring consumers greater transparency in the food sector.” By simply scanning a product using a smartphone, consumers will receive “reliable and unfalsifiable” information on the supply chain and production. 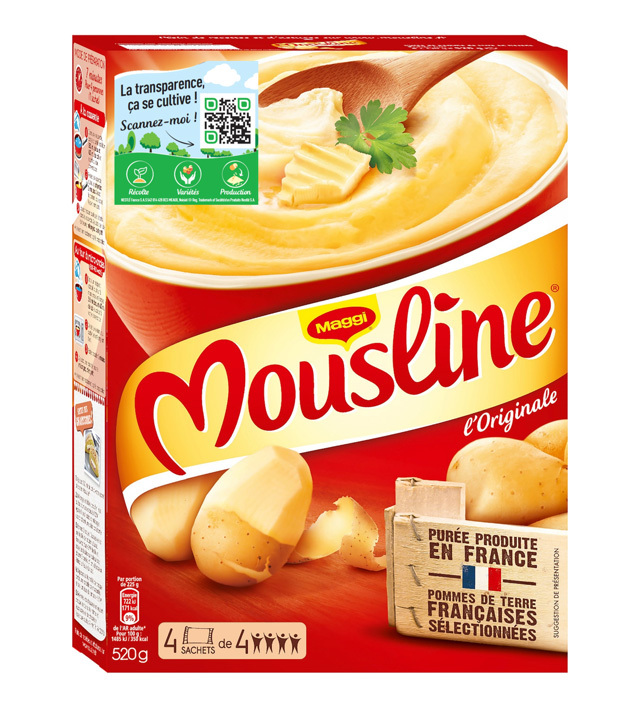 From today (April 15), Blockchain technology will be applied to the well-known Mousline instant mashed potato, available on shelves in Carrefour stores around France. Having joined the IBM Food Trust platform in 2017, as a founding member for Nestlé and last October for Carrefour, the three companies then decided to work on this project together. Click to EnlargeFrom today (April 15), Blockchain technology will be applied to the well-known Mousline instant mashed potato, available on shelves in Carrefour stores around France.Using the QR code on the product’s packaging, each consumer will be able to use a secure platform on their smartphone to access information on the production supply chain, including the varieties of potato used, the dates and places of manufacture, information on quality control and places and dates of storage before the product reaches the shelves. Blockchain technology applied to Mousline instant mashed potato, a product familiar to everyone in France, will highlight the expertise of the farmers and those involved in ensuring the quality of the brand. 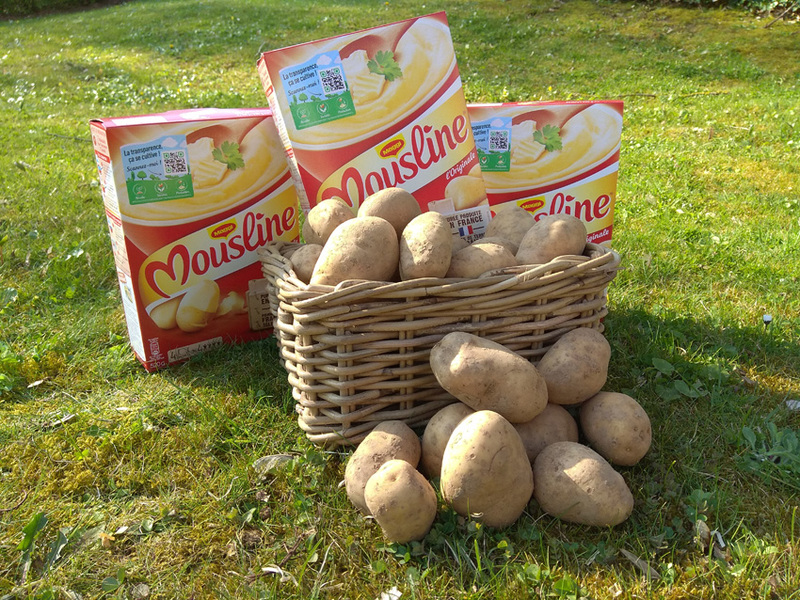 Click to EnlargeBlockchain technology applied to Mousline instant mashed potato, a product familiar to everyone in France, will highlight the expertise of the farmers and those involved in ensuring the quality of the brand.A blockchain, or distributed ledger, can be defined as a continuously growing list (digital file) of encrypted transactions called “blocks” that are distributed (copied) to a peer-to-peer (P2P) network of computers. The structure of blockchain means that it is a decentralized, distributed and public digital ledger that is used to record transactions across many computers so that the record cannot be altered retroactively without the alteration of all subsequent blocks and the collusion of the network. In turn, this allows the participants to verify and audit transactions inexpensively. In the food industry, blockchain is presented as an opportunity to bring greater efficiency, transparency and traceability to the exchanges in supply chains. 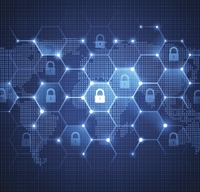 It, therefore, has the potential to play a key role in protecting food integrity. Events in recent years, such as the sale of horsemeat as beef in Europe and the deliberate contamination of strawberries with needles in Australia, highlight the topicality of food fraud, defense and safety concerns. All food businesses are exposed to such supply chain threats and vulnerabilities, which, if not prevented or adequately responded to, may result in illness and death, as well as in economic and reputational damage to individual companies, and indeed the wider food industry. Blockchain is touted as part of the solution, with Walmart being the most high profile retailer to make a move in this area, by demanding that suppliers of lettuce and spinach adopt the system in the coming months.Nestlé started using blockchain in 2017 when it joined the IBM Food Trust as a founding member. The IBM Food Trust aims at reinforcing traceability of food products. Nestlé is testing blockchain technology to create better transparency and visibility of the whole value chain of the products. In October 2018, Carrefour joined the IBM Food Trust. At the time, FoodIngredientsFirst reported that the retailer was adopting the game-changing technology to improve traceability of certain food products with plans to expand to all Carrefour brands by 2022. Click to EnlargeThe pilot will help to understand the impact and scalability of the technology, and inform decisions on further developments. Together with Nestlé, the two companies have been working with IBM blockchain technology to develop the pilot on Mousline purée. “This Mousline pilot is the result of a successful partnership with Carrefour and a great step forward on our blockchain journey. We are using this technology to bring more transparency to our products by providing accurate, trusted and impartial information. That will benefit the whole value chain, including retailers and consumers,” says Vineet Khanna, SVP – Global Head Supply Chain at Nestlé. “Beyond the innovative technology applied to this first blockchain on a national brand, the project is being managed in a totally new way, because, for the first time in Europe, a distributor and a world-famous manufacturer have worked together on its implementation,” a joint statement read. “The expertise of each party has enabled this project to be implemented in under 6 months, by capitalizing on the know-how of IBM, the experience of Nestlé, which launched several tests as a founding member of the Food Trust platform since 2017, and the know-how of Carrefour, which has already rolled out Blockchain technology on several products in its Carrefour Quality Lines since last year,” it noted. For Carrefour, this three-way partnership is positioned as a continuation of its program, Act for Food, that works towards the food transition, and its desire to promote blockchain. “For Nestlé, through a national brand such as Mousline, this first blockchain reinforces the bond of trust with its consumers through the transparency of its supply chain and manufacturing. Staying true to its authenticity and local identity, Mousline is proud to be creating a new close link with its consumers by showcasing its quality and know-how,” a joint statement read.